Tuna sandwiches have long been a picnic basket and lunchbox staple, but now many people have cut back on eating the fish because of concern about its high mercury content. 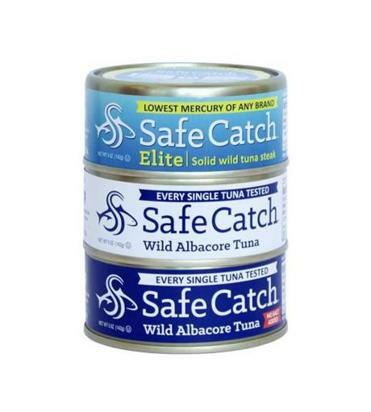 Warnings recommending a limit on tuna for pregnant woman and young children compelled Sean Wittenberg to develop new mercury-testing technology, and to launch, with partner Bryan Boches, Safe Catch, a canned tuna brand that tests each fish for its mercury level. “We test thousands of fish a day,” says Wittenberg, who claims his company is the only one to do so. Their requirements, he says, are 10 times stricter than the US Food and Drug Administration’s. The year-old Bay Area business uses only tuna that is wild and sustainably caught. It hand-cuts and packs the fish raw, then slow-cooks it in the can to retain nutrients; no oil or water is added, so there’s no need to drain. There are three choices, each fresh-tasting and delicious in its natural juices: Elite, made from skipjack tuna; albacore; and albacore with no salt added ($3.50 to $4.50 for 5 ounces). “We want people to feel great again about eating tuna,” says Wittenberg. Available at Wegmans store locations; or go to www.safecatch.com.